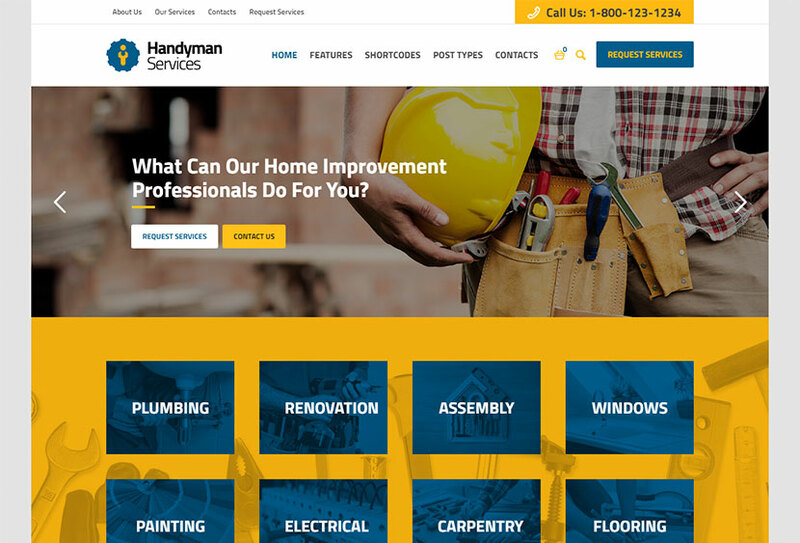 Our WordPress themes collection is devoted to home services like moving, repair, handyman, renovation, construction, plumbing, gardening, electrical, painting, roof repair, flooring, and much more. 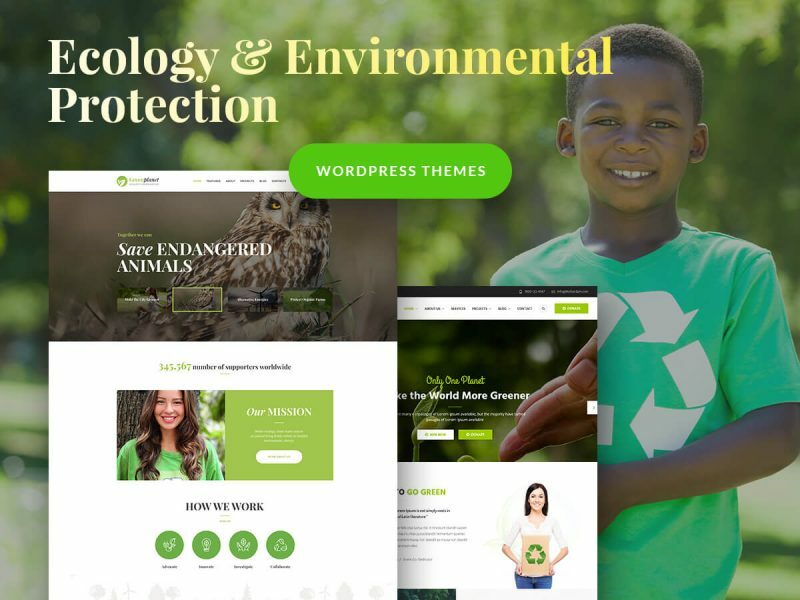 We’ve collected the best and the most popular WP templates coming with a variety of features and possibilities for creating your worthy online presence with minimum efforts and in the shortest period of time. Enjoy! A creative and elegant WordPress theme designed and developed for moving company or local delivery services. You can use it for representing different home and business relocation and packing services, moving apartments, condominiums, and everything in between. The theme is based on King Composer page builder and allows to create pages using the intuitive visual drag-and-drop interface. It includes 4 unique homepage layouts, mega menu module with the editor tool, Contact Form 7 included, a number of premade widgets, interactive portfolio styles, modern blog layouts, and much more features. A WP theme available for creating a renovation or construction company website. If you want to showcase your plumbing services, carpenter and electrician services, building and construction, home renovation and minor repair, this theme is for you. The theme allows price calculation for certain renovation project, electrical repair and plumbing services or even major construction or building project. It is easy to manage, very powerful and comes with highly helpful support assistance. Visual content composer, a collection of shortcodes, page options, form builder, color management, and many more features are available. 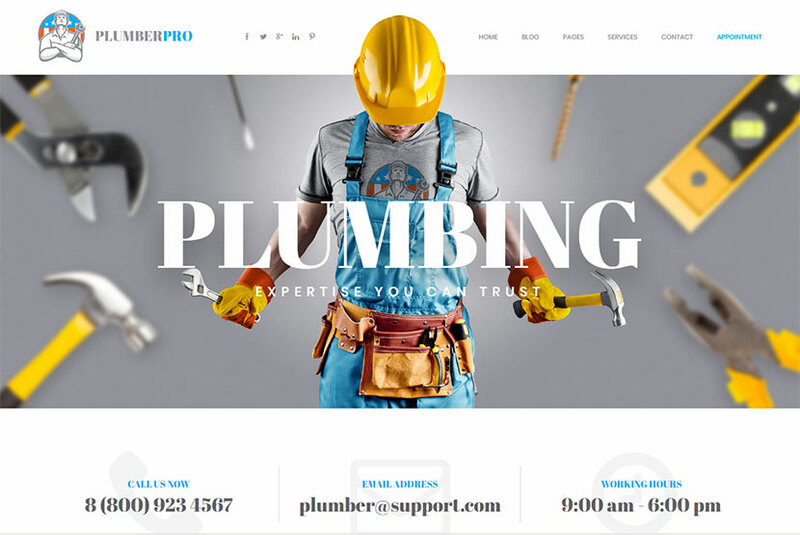 A trendy WordPress theme for a company providing plumber, handyman, renovation or repair services. This is a top-notch design suitable for presenting your home services business in a worthy way. The template includes all modern concepts of plumbing company and contains all necessary pages like services, gallery, pricing, team, appointments, and some others. A compact admin panel and Unyson page builder are the tools integrated into the theme to make it extremely usable and highly customizable. The template is based on Bootstrap and fully responsive. 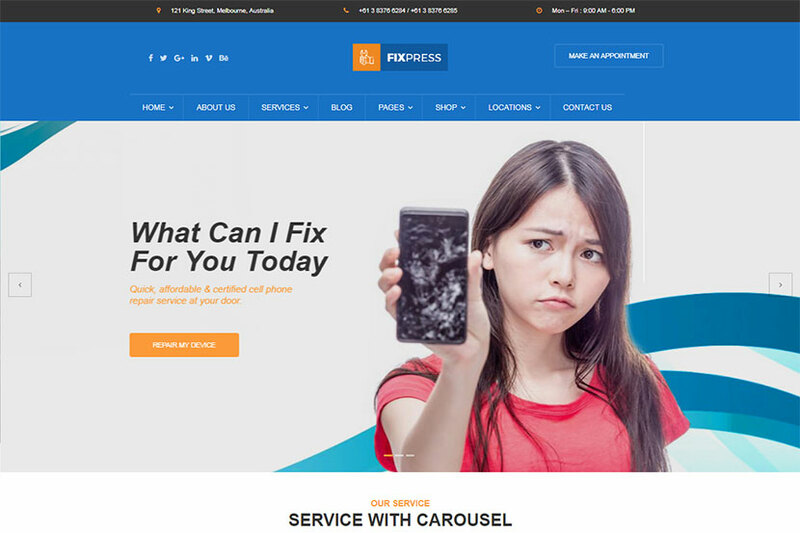 A repairing WordPress theme which is a perfect responsive Bootstrap solution for a website dedicated to phone repair and desktop repair services. Use it to present your repairing services to consumers in an informative manner. The template is full of features and comes with excellent design. It is compatible with the latest WordPress, built with valid HTML5 and CSS3 technologies, supports RTL and WPML (available for creating a multilingual website), comes with theme options within Live Customizer, WooCommerce support, custom post types, unlimited color options, lots of fonts, and much more features. 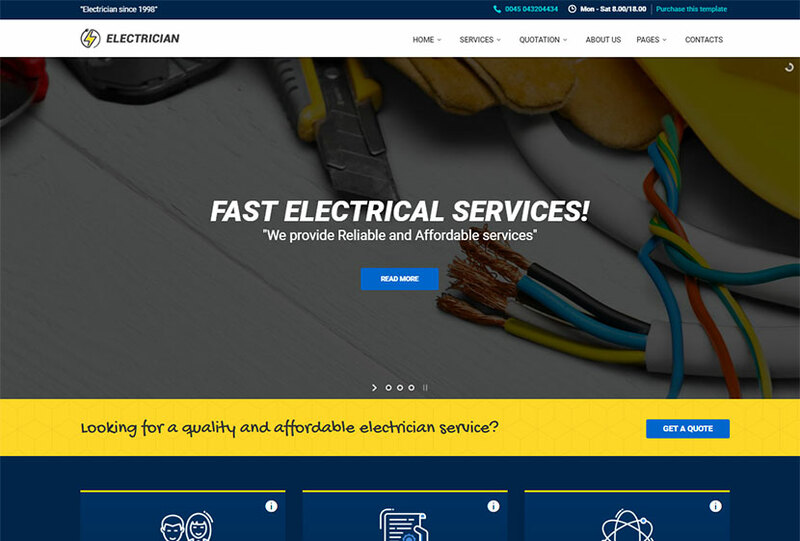 A clean WordPress theme suitable for companies providing electrical, repairing and construction services. It comes with powerful contact forms to hook potential customers and a wizard quotation form, so you get all the elements necessary to create a complete web presence. The template is built on WPBakery drag-and-drop page builder and comes with more than 20 web elements. It has unlimited color styles, blog single page, allows to animate any elements, includes Contact Form 7, jQuery enhanced, unique responsive and retina-ready design, Redux theme options, and many more advantages. 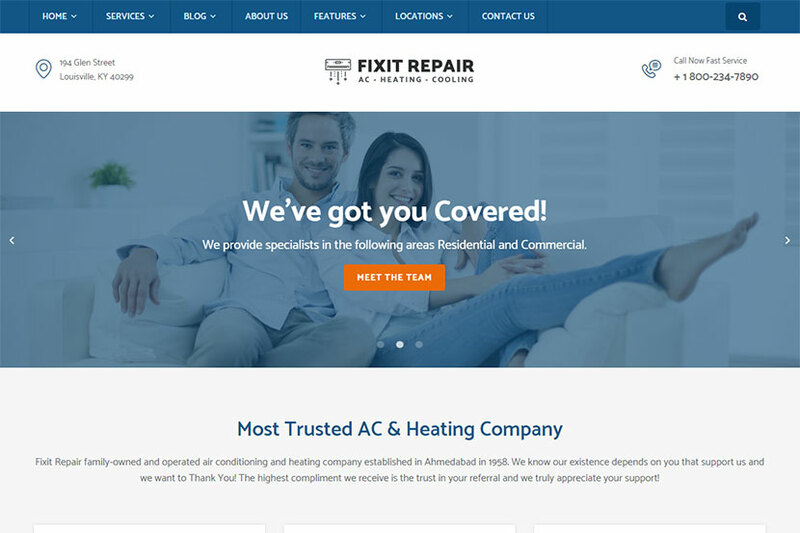 A WordPress theme suitable for all air conditioning repairmen, AC contractors, air handler business owners, ventilating service providers, HVAC repairing, air filtration, and cleaning industries. It is a very professional, clean and high-quality design for creating or revamping your website in a professional way. The template is built on King Composer page builder, comes with multilingual support (RTL, WPML), built on the latest Bootstrap framework, theme options within the Live Customizer, 2 types of headers, fontawesome icons, Contact Form 7 integration, and many more features. 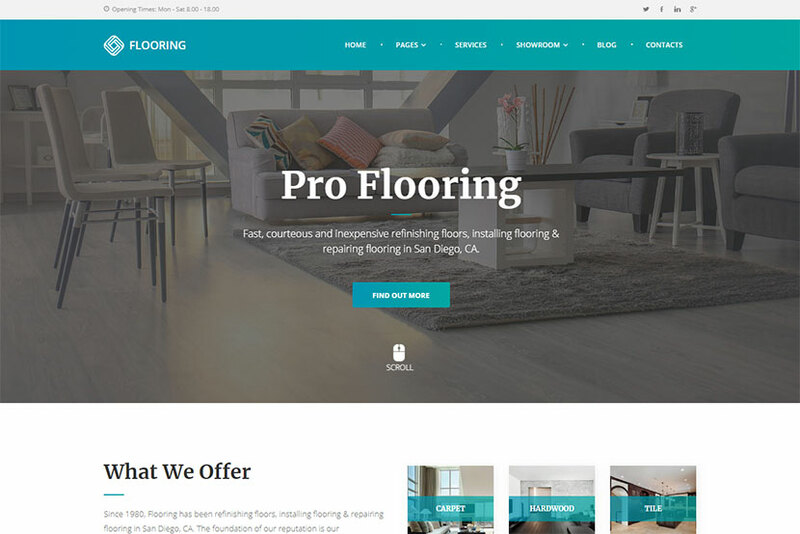 A professional WordPress theme accurately created for flooring business like carpets and hardwood flooring store, tiles, laminate and stone showroom. This theme is a good investment for those who want to represent their flooring services in a perfect way. The template is built on the responsive Bootstrap framework and comes with Unyson page builder for WordPress, so you can create a brilliant website even if you’ve got no coding knowledge. The theme comes in light and dark skins, with boxed and fullwidth layouts, predefined color schemes, free fonts and icons, custom widgets, and many more features. 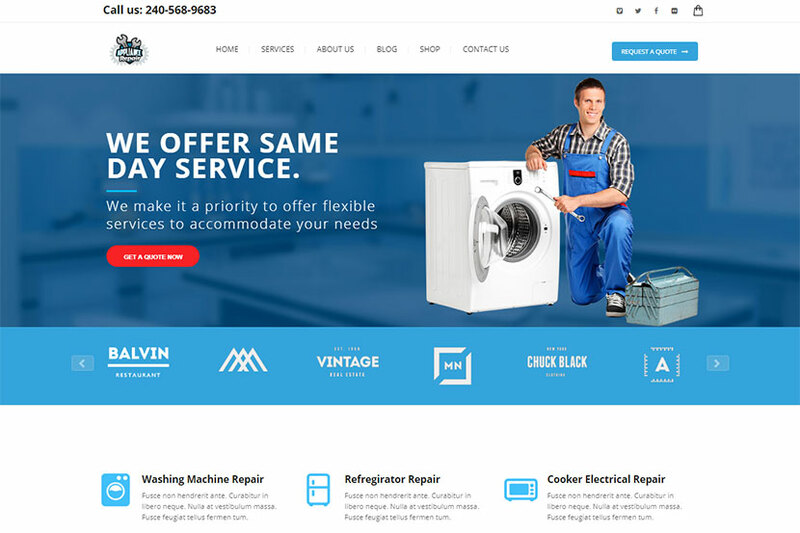 A WordPress theme designed for domestic appliance repair services. You can choose it for appliance repair services, air conditioning service and repair, appliance installation and hook-up, contractors, furnace, refrigeration contractors, water heater, kitchen appliances, washing machines and dryers. The template is based on Zurb foundation 5, comes with WPBakery page builder plugin, boxed and fullwidth layouts, theme color management options, WooCommerce support, unlimited portfolio layouts, RTL and WPML support, Google fonts, and many more features. 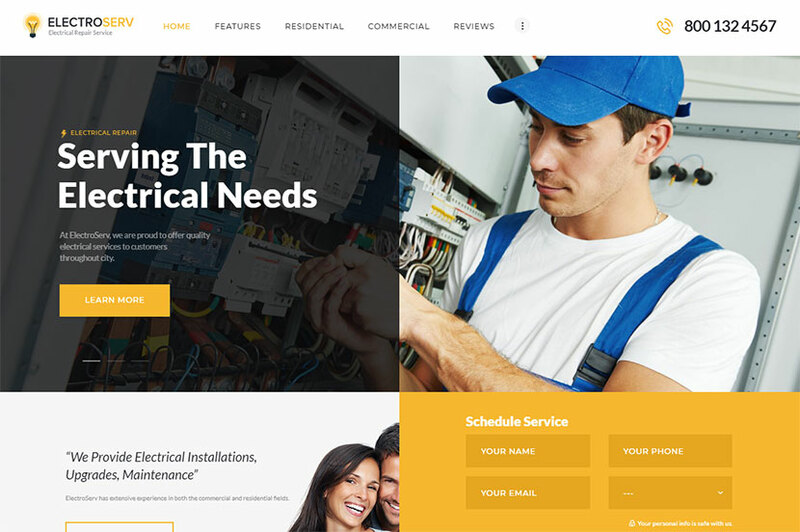 A new WordPress theme with modern and functional design dedicated to maintenance and repair business. The theme can be ideal for companies providing renovation, plumbing, electrical, carpentry, decorating or roofing services. It is also suitable for professional handyman teams, construction business, cleaning agencies, etc. The template comes with professional design, it is fully customizable, built with HTML5 and CSS3 code, includes Slider Revolution & Swiper Slider, supports user menu and main menu, comes with interactive Ajax search, flexible colors & typography, advanced blog settings, WPBakery page builder integration, and many more features. 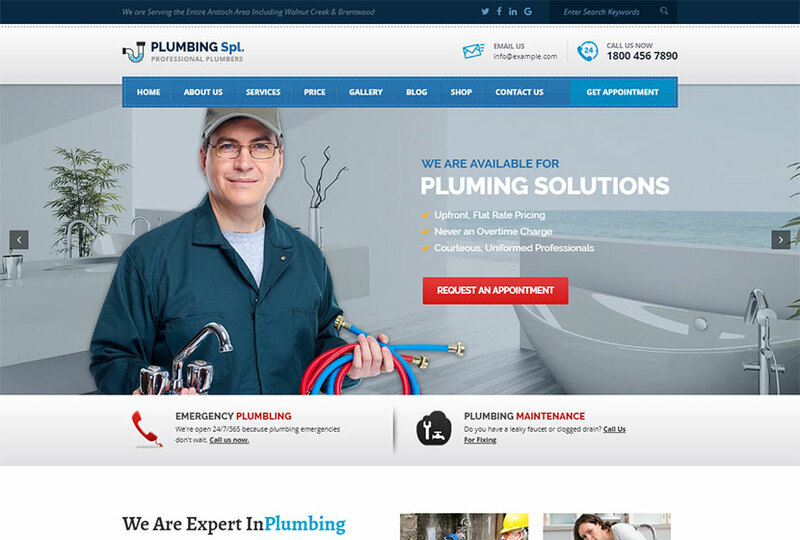 A WordPress theme designed for plumbing companies, plumbers and repairs. It comes with necessary features for your online presence and has a number of pre-made pages like projects, project details, blog, testimonial page etc. The features of the template include Live Customizer support, WooCommerce compatibility, powerful admin panel, WPBakery page builder plugin, multiple headers, multiple homepage templates, fontawesome icons, WPML compatibility, child theme support, and many more advantages. 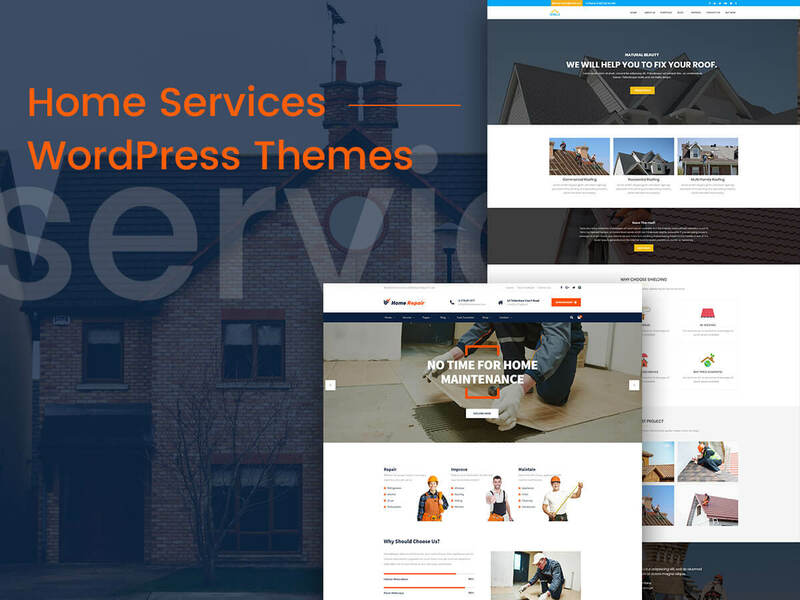 A WP theme quite suitable for building a website to promote services of roofing contractors, construction and renovation companies. It has a location finder which will help clients to easily find a professional roofing repair expert in their location. The features of the theme include advanced Customizer options, more than 10 footer variations, Layers framework, unlimited color options, Mailchimp support, Contact Form 7 integration, neat, clean and simple design, and many more advantages which make this template a superb solution for your website. A WordPress theme available for services like roofing, architecture, plumbing, carpentry, remodeling or decoration. It is suited for professional handyman teams, construction businesses, cleaning agencies or any kind of niche websites related to house repair and household. The template includes a variety of gallery layouts to showcase your works and projects. It comes with a bundle of premium plugins including Revolution Slider, Essential Grid, WPBakery, and more. The plugins will make your work both easier and more effective. Custom widgets and shortcodes, Mailchimp support, theme options panel, and many more features also come with the template. 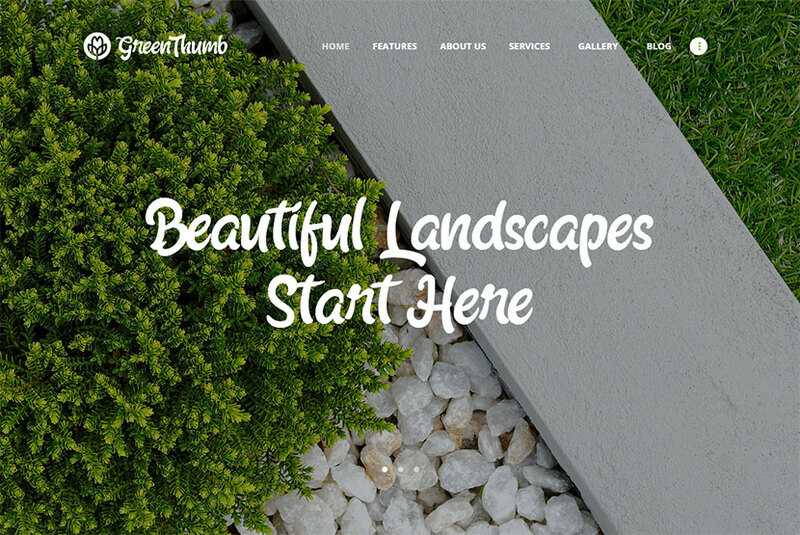 A lightweight and clean WP theme made for gardening and landscape services. It comes with gorgeous ready-made layouts that can be used to display the details of your works. The template offers a number of gallery layouts to show off your projects in the gardening business. The design is supplied with WPBakery plugin – a stunning drag and drop page builder that will allow you become more creative with your website. Thanks to the integration of custom widgets and shortcodes as well as compatibility with a variety of plugins like Revolution Slider, Essential Grid, MailChimp for WP, etc., the theme is really easy to set up and customize. Keep your customers’ homes clean and fixed! Make your home services business bloom!